Governor Phil Bryant signes bill permitting the State of Mississippi to invest in Israel bonds. At the ceremony: Rabbi Jeff Kurtz-Lendner of Beth Israel in Jackson; State Rep. Hank Zuber; Treasurer Lynn Fitch; State Rep. Donnie Hill; Governor Phil Bryant; Executive Director, Israel Bonds Southeast Region Executive Director Brad Young; Israel Consul General from Miami, Lior Haiat; State Rep. Greg Snowden; National Managing Director, Israel Bonds Corporate and Institutional Sales Larry Berman. 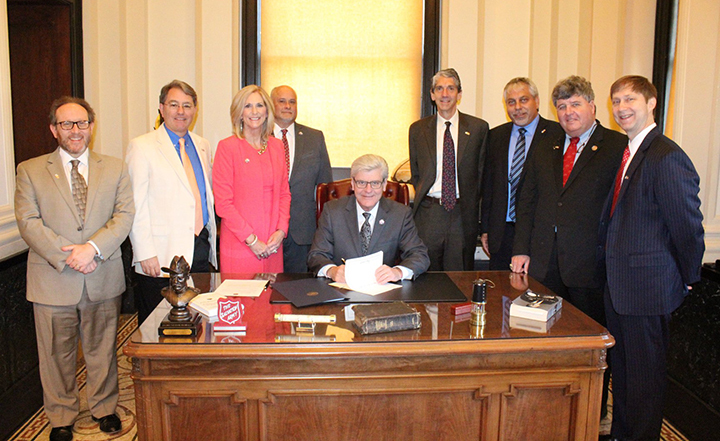 On March 27, Mississippi Governor Phil Bryant signed a law allowing the state to invest a maximum of $20 million in Israel Bonds. The bill takes effect on July 1. It was originally hoped that the bill could be signed during the week of March 12, when Israel Consul General Lior Haiat was in Mississippi for a homeland security conference and meetings in several communities. Alabama currently holds $4 million in Israel Bonds, while Louisiana has $25 million. In February, Arkansas made its first Israel Bonds purchase, $20 million. Also that month, Florida announced a $10 million purchase, bringing its holdings to $50 million.